Use this telescoping magnet, which extends from pen size to 24" to easily retrieve batteries, tools and other metal objects up to ten lbs. from the floor, behind cabinets or heat ducts and more. Useful for extracting wayward cotton or foam blocks, if the string is lost. A quick way to clean vents through earmolds or ITE aids. For cleaning the tubing that connects the hearing aid to the earmold. 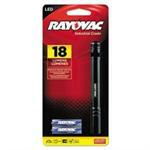 Rayovac LED Earlight, 18 Lumens. The light is concentrated in a small tip that fits most ears. Uses AAA size batteries, included.